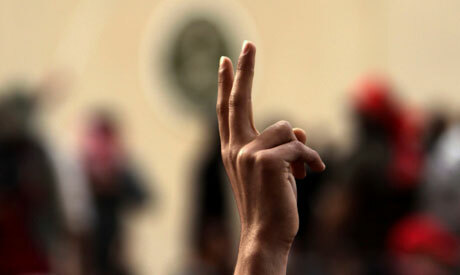 Anti-government protesters gesture in front of the Saudi embassy March 15 in Manama, (AP). Bahrain's parliament on Tuesday accepted the resignations of 11 out of 18 Shiite MPs who stepped down in protest at violence against pro-democracy demonstrators, exposing them to prosecution. The house in a unanimous vote "accepted the resignations of 11 MPs of Al-Wefaq, the largest bloc in the 40-member parliament of the Shiite-majority state, official news agency BNA said. It said that parliament decided to postpone a vote on the other seven members of Al-Wefaq, which heads the opposition in the Gulf country ruled by a Sunni royal family. Tuesday's vote clears the way for the possible prosecution of the outspoken former MPs now stripped of parliamentary immunity. The move came after Bahraini security forces on March 16 drove the mostly Shiite protesters out of Manama's Pearl Square under a state of emergency, ending a month-long campaign on the streets against the regime. The Al-Wefaq bloc suspended its membership in parliament on 15 February in protest at the use of lethal force against demonstrators in Shiite villages, where two demonstrators were shot dead. They stepped down at the end of February, after the death toll had risen to seven. At least 15 Shiites were killed in the clashes with security forces, according to an Al-Wefaq toll. Wefaq had said on Monday 250 people have been detained and 44 others went missing since a security crackdown crushed weeks of protests, more than double last week's figures. They said many Bahrainis, mostly Shi'ites, were being arrested at checkpoints or in house raids. In other cases, family members report that relatives simply do not return home, Wefaq member Mattar Ibrahim Mattar told Reuters by telephone. Bahraini officials were not immediately available to comment on Wefaq's estimated number of those missing or arrested. Wefaq says most of those who were detained or went missing were not activists, though many political leaders were arrested in the days immediately following the 16 March crackdown.